© Carru et al. ; Licensee Bentham Open. Antioxidants exert contrasting effect on low density lipoprotein (LDL) oxidation catalysed by metals, acting as pro-oxidants under select in vitro conditions. Through our study on the effect of coffee on LDL oxidation, we identified the parameters governing this phenomenon, contributing to the comprehension of its mechanism and discovering significant implications for correct alimentary recommendations. By measuring conjugated diene formation, we have analysed the quantitative and qualitative effects exerted by an extract of roasted coffee on LDL oxidation triggered by copper sulphate. When the relative effects of different coffee concentrations were plotted against the lag time (LT) of control LDL (C-LDL), the apparently random experimental data arranged in sensible patterns: by increasing the LT the antioxidant activity of coffee decreased progressively to become prooxidant. The critical LT, at which coffee switches from antioxidant to prooxidant, increased by increasing coffee concentration. Also the contrasting results obtained following a delayed addition of coffee to the assay, arranged in a simple pattern when referred to the LT of C-LDL: the prooxidant effect decreased to become antioxidant as the LT of C-LDL increased. The dependence of coffee effect on the LT of C-LDL was influenced by LDL but not by metal catalyst concentration. These novel findings point to the oxidative state of LDL as a major parameter controlling the anti/prooxidant effect of coffee and suggest the LT of C-LDL as a potent analytical tool to express experimental data when studying the action exerted by a compound on LDL oxidation. Keywords:: LDL oxidation, LDL lag time, antioxidant, prooxidant, roasted coffee. Oxidatively modified low density lipoprotein (LDL) has been found in atherosclerotic lesions of humans and experimental animals [1, 2], and multiple lines of evidence suggest that their oxidative modification may play an important role in the pathogenesis of atherosclerosis and coronary heart diseases [3, 4]. For this reason, it has been hypothesized that compounds able to prevent and or decrease LDL oxidation may have a beneficial effect in the prevention of atherosclerosis. The concept that antioxidants, as α-tocopherol, β-carotene and ascorbic acid, may prevent LDL oxidation and lower the risk to develop atherosclerosis is supported by several epidemiological and experimental studies [5-7]. However controlled clinical trials have so far failed to demonstrate correlation between increased antioxidants consumption and a lower risk of atherosclerotic disease [8-13]. Indeed, in some cases the risk increased in the groups that received antioxidant supplements [14-16]. Additionally, in vitro studies demonstrate that widely used antioxidants may, under certain conditions, exert a prooxidant effect on LDL oxidation [17-21]. On the whole there is a significant body of in vivo and in vitro evidence that questions the idea of a generalised beneficial effect of antioxidants, cautioning against giving alimentary recommendations for disease prevention. It is of great interest to understand the details of the effects antioxidants have on LDL biochemistry as it could provide a rationale for a selective use of these compounds. The most frequently used method to assess the antioxidant potential of a compound is the in vitro LDL oxidation model derived from the method developed by Esterbauer and co-workers  to assess the oxidative state of native LDL. The original analytical procedure amplifies the very low initial oxidative state of LDL by a chain reaction: the trace amount of endogenous lipid hydroperoxide which is present in the lipid fraction, when exposed to transition metal ions such as copper, is oxidatively and reductively decomposed to organic radical species. This leads to the propagation of radical attack on the polyunsaturated fatty acids and to the formation of new lipid peroxides until the polyunsaturated substrates are consumed. Oxidation does not occur instantaneously; a lag phase is generally observed which is followed by the propagation phase. The extent of the lag phase (lag time) is utilized as a sensitive parameter of the oxidative state of LDL and of the resistance of LDL to oxidation . When the test is conducted in the presence of an antioxidant the onset of the propagation phase is delayed and the lag time (LT) is increased compared to the control; the opposite phenomenon is observed in the presence of a prooxidant. This widely used, sensitive and easy spectrophotometric method, however, has some drawbacks due to the difficulty in standardization, the time required, the limited number of assays that can be run. When testing multiple conditions is necessary to perform different experiments utilizing different control LDL (C-LDL); as a consequence, the results obtained frequently are of difficult interpretation and high variability. By utilizing the data acquired when studying the effect of a coffee beverage on LDL oxidation we attempted to create a standardized method to analyze the results obtained with this assay. The choice to use coffee beverage to study LDL oxidation was justified by the fact that this product has been found to exert strong antioxidant properties by virtue of its high content of melanoidins, polymers formed in coffee beans via Maillard reaction during the roasting process . In the present report we show that, by analyzing the results as a function of the LT of C-LDL, both the quantitative and qualitative differences detected can be described by simple patterns. Blood was collected from fasted human volunteers by venipuncture into sampling vials containing EDTA. Plasma was prepared by centrifugation at 2000 g for 10 min a 4°C. LDL was isolated immediately by a very fast ultracentrifugation . LDL was passed through a Sephadex PD-10 column equilibrated with PBS buffer (10 mM potassium phosphate, pH 7.4, containing 0.15 M NaCl) to remove EDTA and other interfering compounds. The total cholesterol of the salt-free LDL sample was determined with the CHOD-PAP enzymatic test kit (Boehringer, Mannhein, Germany) and the concentration was adjusted with PBS buffer (pH 7.4) to 80 µg/ml of cholesterol. LDL samples (1ml) were added with 2 µg/ml roasted coffee at 30°C prior to the initiation of oxidation by 1 µM copper sulphate. The conjugated dienes were monitored at 234 nm at 3 min intervals for a period of 9 h. The kinetic of LDL oxidation are characterized by the LT.
Light roasted coffee powder (Coffea Robusta 50 % and Coffea Arabica 50 %) characterised by a color test Neuhaus of 110 (CTN110), and a roasting loss of 14%, were obtained by a company joined the Cost Action 919 “Melanoidins and Health”. Coffee solution was prepared at 1% by dilution of coffee powder in hot water immediately before use. First we evaluated the influence exerted on LDL oxidation, triggered by 1 µM copper, by variable amounts of a coffee solution. The results reported in Fig. (1) show that different coffee concentrations may exert either an antioxidant or a prooxidant effect, in particular the lower concentrations tested were pro-oxidant whereas the highest was antioxidant. Fig. (1). Cu2+ catalysed LDL peroxidation: antioxidant and prooxidant effect of coffee. 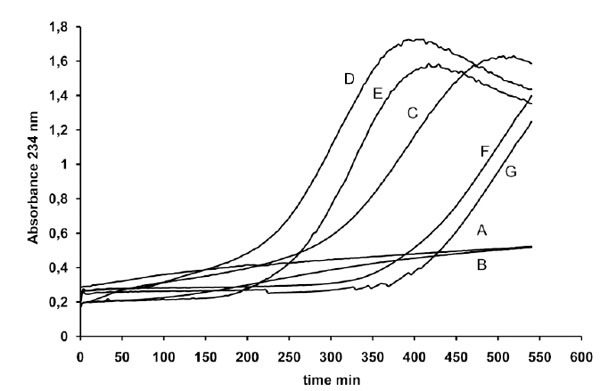 LDL (80 µg cholesterol) from a single donor was incubated either without metal catalyst (line A) in the presence of 1 µg coffee (line B) or with 1 µM copper sulphate in the absence (line C) or presence of different amounts of a coffee solution (line D 0.5 µg, line E 1 µg, line F 2 µg and line G 4 µg of coffee per assay). LDL oxidation was followed by monitoring the change of the conjugated diene absorbance at 234 nm. However, when a similar experiment was repeated with different LDL preparations, quantitative and qualitative differences in coffee activity were observed, as shown by some representative results presented in Table 1. The effect exerted by 0.5 µg coffee, for instance, could range roughly from 50% shortening to 150% lengthening the LT. Trying to find a rationale to such an inconsistent behaviour we expressed the data as a function of various parameters. When the relative coffee effects exerted by 0.5 µg coffee in different experiments were plotted against the LT of C-LDL, the experimental data arranged in a sensible pattern (Fig. 2): by increasing the LT of C-LDL, the antioxidant activity of 0.5 µg coffee progressively decreases to become prooxidant when the LT exceeds 110-120 min. When the effect of higher coffee concentrations was evaluated, similar patterns were observed although the "critical" LT, at which coffee switches from antioxidant to prooxidant, increases (Fig. 2). We also studied the influence of copper concentration on the effect of coffee. In Table 2 and Fig. (3) are reported the results obtained when three LDL preparations were incubated either with 1 or 4 µM Cu2+ in the absence and presence of 2 µg coffee. a LDL (80 μg cholesterol) from different donors were incubated with 1 μM copper sulphate in the absence or presence of different amounts of a coffee solution (μg of coffee per assay). LDL oxidation was followed by monitoring the change of the conjugated diene absorbance at 234 nm. The length of lag time is reported and expressed as percentage of the lag time of control LDL. Fig. (2). Cu2+ catalysed LDL peroxidation: effect of coffee concentration. The data reported in Table 1 and part of the data reported in Table 3 are presented. 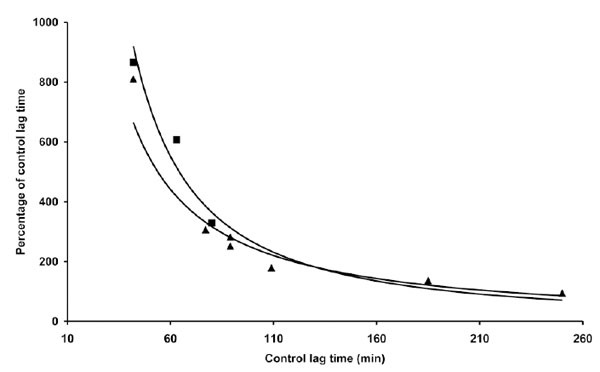 The length of the lag time obtained in the presence of coffee expressed as percentage of the lag time of control LDL was reported as a function of the lag time of control LDL. LDL (80 µg cholesterol) from different donors was incubated with 1 µg copper sulphate in the absence or presence of different amounts of a coffee solution: 0.5 µg (♦), 1 µg (▀), 2 µg (▲) and 4 µg (●) of coffee per assay. LDL oxidation was followed by monitoring the change of the conjugated diene absorbance at 234 nm. a LDL (80 μg cholesterol) from different donors were incubated with either 1 or 4 μM copper sulphate in the absence or presence of 2 μg coffee. LDL oxidation was followed by monitoring the change of the conjugated diene absorbance at 234 nm. The length of lag time is reported and expressed as percentage of the lag time of control LDL. Fig. (3). Cu2+ catalysed LDL peroxidation: influence of Cu2+ concentration on coffee effect. The data reported in Table 2 and part of the data reported in Table 1 are presented. 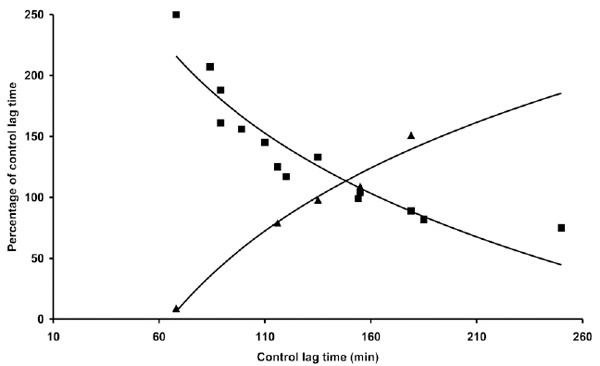 The length of the lag time obtained in the presence of coffee expressed as percentage of the lag time of control LDL was reported as a function of the lag time of control LDL. LDL (80 µg cholesterol) from different donors was incubated with either 1 µg (▲) or 4 µM (▀) copper sulphate in the absence or presence of 2 µg coffee. LDL oxidation was followed by monitoring the change of the conjugated diene absorbance at 234 nm. Although the quantitative antioxidant effects of coffee appear to differ when assayed in the presence of the two copper concentrations (Table 2), no substantial difference was observed when the relative coffee effects were expressed as a function of C-LDL LT (Fig. 3). We also studied the influence of the time of coffee addition on LDL oxidation triggered by copper. In the experiments presented (Fig. 4), 1 µg coffee, when added before copper addition, exerted mostly an antioxidant effect, although it quantitatively differed depending on the LT of C-LDL: as previously observed, the shorter the lag time the stronger the antioxidant effect. However, if coffee addition was delayed 10 min, the results obtained drastically changed but, once again, they depended on the LT of C-LDL. Coffee exerted a prooxidant effect whose intensity decreased to become antioxidant by increasing the LT of C-LDL (Table 3 and Fig. 4). a LDL (80 μg cholesterol) from different donors were incubated with 1 μM copper sulphate in the absence or presence of 1 μg coffee. Coffee was added at the stated times. LDL oxidation was followed by monitoring the change of the conjugated diene absorbance at 234 nm. The length of lag time is reported. To the lag time of the assays conducted in the presence of coffee we subtracted the delay in its addition and the data were expressed as percentage of the lag time of control LDL. Fig. (4). Cu2+ catalysed LDL peroxidation: effect of the delayed addition of coffee. Part of the data reported in Table 3 and in Tables 1 and 4 are presented. 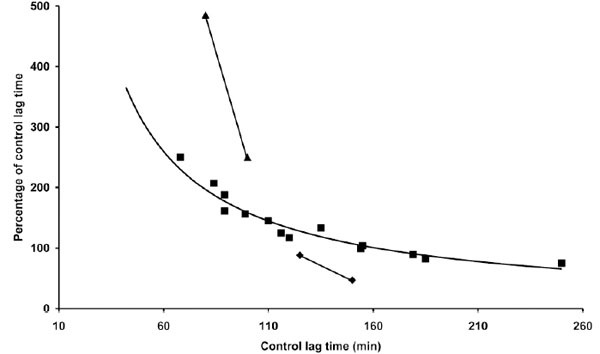 The length of the lag time obtained in the presence of coffee expressed as percentage of the lag time of control LDL was reported as a function of the lag time of control LDL. LDL (80 µg cholesterol) from different donors was incubated with 1 µM copper sulphate in the absence or presence of 1 µg coffee. Coffee was added either just before (▀) or 10 min after (▲) copper sulphate addition. LDL oxidation was followed by monitoring the change of the conjugated diene absorbance at 234 nm. When, in the same experiments, 1 µg coffee was added after 30 min it almost immediately elicited the onset of the propagation phase. The only exception was the LDL preparation with the longer LT: in this case the LT was further prolonged by coffee delayed addition (Table 3). The influence of LDL concentration on coffee effect was also studied. The results presented in Table 4 indicate that the same concentration of coffee (1 µg) may be either antioxidant or prooxidant depending on LDL concentration in the reaction mixture. As shown in Fig. (5) the effect appears to be only partially related to the LT of the different LDL concentrations. In particular at LDL concentrations half and double that standardly utilized (80 µg cholesterol) the coffee effect diverges from the normal pattern, exerting, respectively, a more pronounced antioxidant or prooxidant action. a Three concentrations (40, 80 and 160 μg cholesterol) of LDL from two different donors were incubated with 1 μM copper sulphate in the absence or presence of 1 μg coffee. LDL oxidation was followed by monitoring the change of the conjugated diene absorbance at 234 nm. The length of lag time is reported and expressed as percentage of the lag time of control LDL. Fig. (5). Cu2+ catalysed LDL peroxidation: influence of LDL concentration on coffee effect. Part of the data reported in Table 4 and in Tables 1 and 3 are presented. 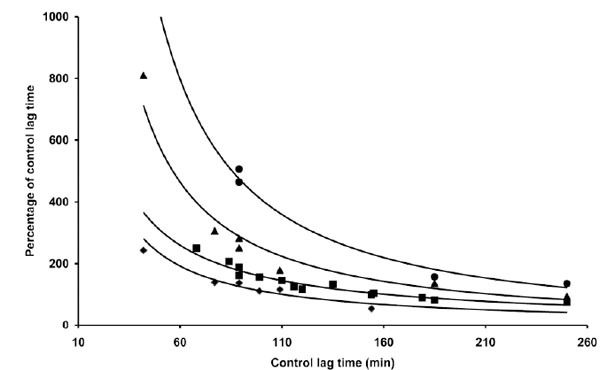 The length of the lag time obtained in the presence of coffee expressed as percentage of the lag time of control LDL was reported as a function of the lag time of control LDL. Three concentrations 40 (▲), 80 (▀) and 160 (♦) µg cholesterol of LDL from different donors were incubated with 1 µM copper sulphate in the absence or presence of 1 µg coffee. LDL oxidation was followed by monitoring the change of the conjugated diene absorbance at 234 nm. When studying the action of a compound and/or when comparing the effect of different compounds on LDL oxidation, great difficulties are encountered due to the variability in the results obtained in different experiments. Quantitative differences are normally observed and it is not infrequent to detect qualitative differences. While studying the antioxidant activity of soluble coffee, we observed similar variations. In different experiments, when the effect of a fixed concentration of coffee was studied, not only we observed quantitative differences in the relative antioxidant activity but also qualitative differences (Table 1). However, through a detailed analysis of the data set obtained in different experiments we identified a relation between the LT of C-LDL and the effect of the coffee under test. When a fixed concentration of coffee is incubated with LDL in the presence of copper, (Fig. 2), both quantitative and qualitative differences between different experiments are shown to depend on the LT of the LDL: apparently the same coffee concentration is antioxidant when C-LDL have a short LT and eventually becomes prooxidant when C-LDL with long LT are utilized. Furthermore, the data presented in the same figure show that the effects exerted by increasing concentrations of coffee, in different experiments, follow similar patterns when related to the LT of C-LDL. With higher coffee concentrations, however, the curves are shifted towards a more effective antioxidant action and the C-LDL LT that switches coffee from an antioxidant to a prooxidant effect increases. Thus, C-LDL with short LT are protected from peroxidation by all coffee concentrations tested (0.5, 1, 2 and 4 µg) whereas, as the LT of C-LDL increases, coffee loses its antioxidant potential to become prooxidant, the lowest concentration being the most effective. Also the different quantitative effects (Table 2) observed in three different experiments and exerted by two different copper concentrations (1 and 4 µM) in the presence of a fixed coffee amount (2 µg) follow the same pattern when referred to the LT of C-LDL (Fig. 3). We have also evaluated the influence exerted by the LT of C-LDL on the effect exerted by coffee when added at different time points after the triggering of LDL oxidation by copper. In fact, it was previously shown that antioxidants may become prooxidant also when added during the lag phase of copper stimulated LDL oxidation and in particular when added at late time points during oxidation [20-21]. Also in these experiments we obtained conflicting results (Table 3) which, however, followed a pattern when referred to the LT of C-LDL (Fig. 4). The pattern was particularly evident analysing the data obtained when coffee was added 10 min after the metal catalyst. The prooxidant effect exerted by the delayed addition of coffee decreases to became antioxidant as the LT of C-LDL increases. Apparently coffee is able to stimulate the oxidation already triggered by copper when C-LDL have a short LT whereas it counteracts oxidation of C-LDL with a long LT. The effect exerted by C-LDL LT on the delayed addition of coffee is confirmed by the results obtained when coffee was added after 30 min. Also in this case C-LDL with the longest LT was protected by coffee which was capable of delaying the onset of propagation, not only when compared to the control but also when compared to the sample where coffee was added at the beginning of incubation (Table 3). The data presented in Table 4 and Fig. (5) clearly demonstrate that not all experimental data can be pooled to obtain the pattern describing the action of coffee on LDL oxidation. In fact when LDL concentrations different from the standard are utilized, the coffee effect appears to be only partially related to the LT of C-LDL. In their complex the results presented, suggest the use of the LT of C-LDL as a potent analytical tool to express the data experimentally obtained when studying the action exerted by a compound on LDL oxidation. With this simple method, in fact, we were able to describe the pattern of coffee action on LDL oxidation triggered by copper by utilising most of the apparently different and, sometimes, conflicting data obtained during our study. We are at present testing the possibility of utilizing this method to compare the relative tendency of different compounds to affect Cu2+-catalysed LDL oxidation. The results obtained could be of great relevance for the standardization of the procedures for the assessment of the capacity of compounds to affect LDL oxidation. Besides the methodological interest, the results we have presented might be of some relevance also to furnish a rationale base for the comprehension of the various and contrasting effects exerted by antioxidants on LDL oxidation both in vitro and in vivo. The use of LDL differing in their lag times might be, in some instances, responsible of the results described in vitro whereas the results obtained in vivo might be related to the LDL oxidative state of the different patients. If this was the case, the assessment of the LDL LT of a patient might possibly be not only a predictive index of a physiopathological state but also a guide for an aimed nutritional approach. In the experiments presented, in fact, coffee exerted either a beneficial or detrimental effects on LDL oxidation depending not only on its concentration but also on the LDL oxidative state of the donor. In this context, the omission of measuring the oxidant/antioxidant status of people before undergoing antioxidant treatment has been contemplated as one of the causes accounting for the failure of antioxidant-based strategies in the prevention or treatment of cardiovascular pathologies . Thus the oxidative state of circulating LDL should be probably considered when giving alimentary recommendations of the use of antioxidants to reduce cardiovascular risk. We also hypothesized a potential mechanisms that might be at the base of the relation between the LT of C-LDL and the antioxidant/prooxidant effect of a compound. In general, metal catalysed lipid peroxidation is a complex system whose kinetics is driven by chain initiation, propagation, branching and termination reactions. In particular the lag phase is related to the time required for the formation or accumulation of the peroxyl radical species responsible for initiating lipid peroxidation to such a degree that its reaction with lipid become dominant over all competitive reactions with other species present in the environment. In a simple phosphatidylcholine liposome model the LT is interpreted as the time needed to lower the concentration of the reduced form of the metal catalyst to such a degree that the peroxyl radical initiator can no longer be effectively suppressed by it and can reach the level at which its reaction with the fatty acid chains become dominant [26-28]. The LT is thus controlled by the lipid hydroperoxide content of the liposomes which, by reacting with the metal catalyst, affects its reduced to oxidized ratio. In this model system exogenous compounds can act either as antioxidant or prooxidant by affecting both the ratio between the reduced and oxidized form of the metal catalyst and the concentration of the peroxyl radical species responsible for initiating lipid peroxidation [27, 29]. In the case of LDL peroxidation, besides hydroperoxide, other endogenous compounds  may affect the reduced to oxidized ratio of the metal catalyst  and the concentration of the peroxyl radical species. As a consequence, the length of the LT of native LDL is already the outcome of the interplay of the effects exerted by the variable concentrations of these endogenous compounds within the LDL and, for this reason, may be variable. In this light it is not surprising that addition of an antioxidant may have qualitatively and quantitatively different effects on LDL peroxidation depending on the LDL oxidative state testified by the length of its LT. This study was supported by the Italian Ministry of University and Research (PRIN-2005) and Banco di Sardegna Foundation (Grant-2009). Hoff HF, Gaubatz JW. Isolation, purification, and characterization of a lipoprotein containing Apo B from the human aorta Atherosclerosis 1982; 42: 273-97. Palinski W, Rosenfeld ME, Yla-Herttuala S, et al. Low density lipoprotein undergoes oxidative modification in vivo Proc Natl Acad Sci USA 1989; 86: 1372-6. Steinberg D, Parthasarathy S, Carew TE, Khoo J, Witztum JL. Beyond cholesterol. Modifications of low-density lipoprotein that increase its atherogenicity N Engl J Med 1989; 20: 915-24. Inoue T, Uchida T, Kamishirado H, Takayanagi K, Hayashi T, Morooka S. Clinical significance of antibody against oxidized low density lipoprotein in patients with atherosclerotic coronary artery disease J Am Coll Cardiol 2001; 37: 775-9. Riemersma RA, Wood DA, Macintyre CC, Elton RA, Gey KF, Oliver MF. Risk of angina pectoris and plasma concentrations of vitamins A, C, and E and carotene Lancet 1991; 337: 1-5. Gey KF, Moser UK, Jordan P, Stahelin H, Eichholzer M, Lüdin E. Increased risk of cardiovascular disease at suboptimal plasma concentrations of essential antioxidants: an epidemiological update with special attention to carotene and vitamin C Am J Clin Nutr 1993; 57: 787-97. Clifton PM. Antioxidant vitamins and coronary heart disease risk Curr Opin Lipidol 1995; 6: 20-4. Kritharides L, Stocker R. The use of antioxidant supplements in coronary heart disease Atherosclerosis 2002; 164: 211-9. Stephens NG, Parsons A, Schofield PM, Kelly F, Cheeseman K, Mitchinson MJ. Randomised controlled trial of vitamin E in patients with coronary disease: Cambridge Heart Antioxidant Study (CHAOS) Lancet 1996; 347: 781-6. Rapola JM, Virtamo J, Ripatti S, et al. Randomised trial of alpha-tocopherol and beta-carotene supplements on incidence of major coronary events in men with previous myocardial infarction Lancet 1997; 349: 1715-20. Yusuf S, Dagenais G, Pogue J, Bosch J, Sleight P. Vitamin E supplementation and cardiovascular events in high-risk patients. The Heart Outcomes Prevention Evaluation Study Investigators N Engl J Med 2000; 342: 154-60. Hasnain B, Mooradian A. Recent trials of antioxidant therapy: What should we be telling our patients? Cleve Clin J Med 2004; 71: 327-34. Ferns G, Lamb D. What does the lipoprotein oxidation phenomenon mean? Biochem Soc Trans 2004; 32: 160-3. Virtamo J, Pietinen P, Huttunen JK, et al. ATBC Study Group. Incidence of cancer and mortality following alpha-tocopherol and beta-carotene supplementation: a postintervention follow-up JAMA 2003; 290: 476-85. Lonn E, Bosch J, Yusuf S, et al. HOPE and HOPE-TOO Trial Investigators. Effects of long-term vitamin E supplementation on cardiovascular events and cancer: a randomized controlled trial JAMA 2005; 293: 1338-47. Miller ER, Pastor-Barriuso R, Dalal D, Riemersma RA, Appel LJ, Guallar E. Meta-analysis: High-dosage vitamin E supplementation may increase all-cause mortality Ann Intern Med 2005; 142: 37-46. Kontush A, Finckh B, Karten B, Kohlschutter A, Beisiegel U. Antioxidant and prooxidant activity of alpha-tocopherol in human plasma and low density lipoprotein J Lipid Res 1996; 37: 1436-48. Thomas SR, Neuzil J, Stocker R. Cosupplementation with coenzyme Q prevents the prooxidant effect of alpha-tocopherol and increases the resistance of LDL to transition metal-dependent oxidation initiation Arterioscler Thromb Vasc Biol 1996; 16: 687-96. Bowen HT, Omaye ST. Oxidative changes associated with beta-carotene and alpha-tocopherol enrichment of human low-density lipoproteins J Am Coll Nutr 1998; 17: 171-9. Bagnati M, Perugini C, Cau C, Bordone R, Albano E, Bellomo G. When and why a water-soluble antioxidant becomes pro-oxidant during copper-induced low-density lipoprotein oxidation: a study using uric acid Biochem J 1999; 340: 143-52. Albertini R, Abuja PM. Prooxidant and antioxidant properties of Trolox C, analogue of vitamin E, in oxidation of low-density lipoprotein Free Radic Res 1999; 30: 181-8. Esterbauer H, Striegl G, Puhl H, Rotheneder M. Continuous monitoring of in vitro oxidation of human low density lipoprotein Free Radic Res Commun 1989; 6: 67-75. Nicoli MC, Anese M, Manzocco L, Lerici CR. Antioxidant properties of coffee brews in relation to the roasting degree LWT-Food Sci Technol 1997; 30: 292-7. Himber J, Buhler E, Moll D, Moser UK. Low-density-lipoprotein for oxidation and metabolic studies - isolation from small volumes of plasma using a tabletop ultracentrifuge Int J Vitam Nutr Res 1995; 65: 137-42. Steinberg D, Witztum JL. Is the oxidative modification hypothesis relevant to human atherosclerosis? Do the antioxidant trials conducted to date refute the hypothesis? Circulation 2002; 105: 2107-11. Tadolini B, Cabrini L, Menna C, Pinna GG, Hakim G. Iron (III) stimulation of lipid hydroperoxide-dependent lipid peroxidation Free Radic Res 1997; 27: 563-76. Tang L, Zhang Y, Qian Z, Shen X. The mechanism of Fe(2+)-initiated lipid peroxidation in liposomes: the dual function of ferrous ions, the roles of the pre-existing lipid peroxides and the lipid peroxyl radical Biochem J 2000; 352 Pt 1: 27-36. Wilcox AL, Marnett LJ. Polyunsaturated Fatty-Acid Alkoxyl Radicals Exist as Carbon-Centered Epoxyallylic Radicals - a Key Step in Hydroperoxide-Amplified Lipid-Peroxidation Chem Res Toxicol 1993; 6: 413-6. Minotti G, Aust SD. Redox Cycling of Iron and Lipid-Peroxidation Lipids 1992; 27: 219-26. Perugini C, Bagnati M, Cau C, et al. Distribution of lipid-soluble antioxidants in lipoproteins from healthy subjects. I. Correlation with plasma antioxidant levels and composition of lipoproteins Pharmacol Res 2000; 41: 55-65. Visioli F, Bordone R, Perugini C, Bagnati M, Cau C, Bellomo G. The kinetics of copper-induced LDL oxidation depend upon its lipid composition and antioxidant content Biochem Biophys Res Commun 2000; 268: 818-22.